Superintendent Bryan Johnson speaks during a news conference announcing the launch of the Future Ready Institutes at Howard School on Thursday, March 15, 2018, in Chattanooga, Tenn.
Incoming Hamilton County high school students have four more options to choose from when applying to Future Ready Institutes in the fall. Lookout Valley High and Central High schools have joined the list of 13 schools that will offer a small learning community with an industry theme to students, the district announced Monday. Central's institute will focus on advanced manufacturing and mechatronics, and Lookout Valley's will focus on digital media production. A business entrepreneurial institute will join two other institutes focused on agriculture and health care at Hixson High and an architectural and engineering design-focused academy will join the International Baccalaureate Institute at Ooltewah High. 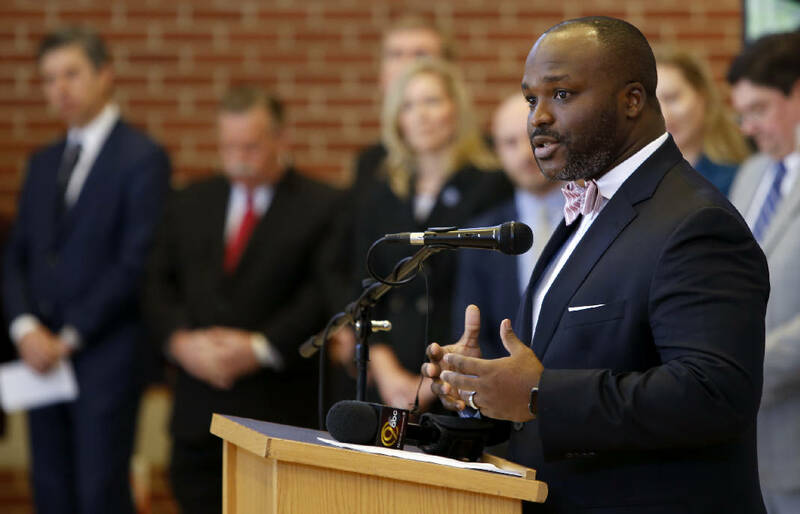 The district officially launched the Future Ready Institutes, which are a partnership among the district, Chattanooga 2.0 and business and community partners, in March. The institutes will launch this fall with 100 students in ninth grade, engaging in traditional and unique courses pertaining to their industry theme. Students still will take traditional classes in four core areas — English, math, science and social studies — in addition to the career and technical courses, and teachers will plan lessons around student projects across all subject areas. Each year, 100 more students will be added, with seats available to both zoned students and students from outside that particular high school's zone. "Producing graduates who are post-secondary ready and prepared to succeed in college or a career is vital for our children, Hamilton County Schools, and the community," said Bryan Johnson, superintendent of Hamilton County Schools, in a statement. "The Future Ready Institutes will continue to grow and provide opportunities and possibilities for a foundation of success for our graduates and their families." The Future Ready Institutes, modeled after similar career academies in Clarksville-Montgomery County Schools, where Johnson worked previously, and the academies of Metro Nashville Public Schools, are the district's latest approach to bridging the gap between education and jobs and industry. Local leaders have acknowledged the gap, especially when it comes to the skills and abilities of graduates of local schools and the jobs available. Many businesses have struggled to recruit in recent years. Other institute themes include medicine — Erlanger is one of the founding partners and has committed to a health sciences institute at The Howard School — robotics, aviation, teaching, forensic science and hospitality, among others. "Future Ready Institutes are dynamic by design and will continue to evolve and grow as we move forward," said Blake Freeman, director of Future Ready Institutes for Hamilton County Schools. "The application process continues for upcoming ninth-grade students in our high schools, and we are pleased to add these options for our incoming freshmen." Current eighth-grade students can apply to the institutes through Friday. Applications are available online. For more information about the institutes, visit www.hcde.org/futureready.